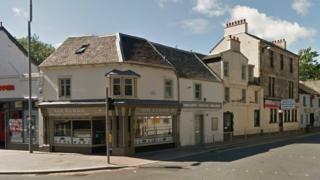 A man with a knife has assaulted two other men near a kebab shop in Paisley. The victims, aged 26 and 27, were hurt as they walked in Causeyside Street, close to the Mr Kebab takeaway, at about 03:00. They were taken by ambulance to the Royal Alexandra Hospital for treatment. They have now been released. The police have said the attack appears to have been unprovoked, and they have appealed for any witnesses who have yet to speak to them to come forward. Officers have issued a description of a man they want to speak to in connection with the attack. He is white, 6ft tall, with stocky build and short brown hair. He was wearing a black polo shirt, dark trousers and dark shoes. Det Sgt Craig Riddell said: "This would appear to be a totally unprovoked attack which left the two men with serious injuries requiring hospital treatment. "We are currently viewing CCTV and know that there were a number of people in the area at this time that we would like to speak to, especially two women who tried to intervene as the assaults were taking place. "It is vital that theses woman contact police at Paisley immediately."